Why email should continue to play a significant role in marketing strategy. Over the last decade or so relationships have been neglected as marketers focused on trying to get their message in front of as many people as possible without regard for timing or relevancy. However, we're all tired of poorly targeted and badly timed emails and we all routinely delete far more than we read. So, for a marketer, the question has become whether it's still worthwhile to invest resources in this marketing channel. Email is one of the primary communication channels with the phone, chats, and social making up the others. Different personas in different circumstances are likely to prefer different channels depending on their requirements at the time. Chat may be the preferred channel in the early stages of the selling cycle, but email may be preferred later when an exchange of detailed information is more likely to be taking place. Ultimately, what must be remembered is that there's a human on the other end of an email so, when used properly, this channel can still play an important role in building trust. In creating a great email strategy, it's possible to provide sustainable, helpful, human experiences that result in real relationships and a consistent ROI. Some, typically millennials, may increasingly view email as a relic of the early internet age that's to be shunned in favor of other channels. However, email remains a platform that integrates well and can make other channels such as chat even more successful. You can't make email marketing part of your strategy without a contact list, a contact list that's been earned (not purchased) and which each member of has explicitly granted permission for you to send emails to. The mantra for world-class email marketing is to send the right content to the right person at the right time. To accomplish this you must know the persona of the contact you're sending to as well as where they are positioned in the buying journey. A specific purpose must be established for every email to be sent to every contact. In this context, the need for mapping content to the persona and where they are in the buying journey should be clear. Delivering the right content, to the right person at the right time may sound simple but, when combined with the individual's position in the buying journey, a lot of complexity is introduced that requires automation to effectively manage. There's an upfront cost associated with effective email marketing. Neglect this investment and the campaign results will reflect the effort as well as potentially damage the brand associated with it. Depending on whom you talk to may depend on whether email marketing is considered obsolete or (at the other end of the scale) still the single most effective way to reach and engage with a relevant audience. According to estimates from the Radicati Group, 2017 will see nearly 5 billion email accounts owned by 2.75 billion account holders representing an average of 1.8 accounts per holder. In 2015 it was estimated over 205 billion emails were sent and received per day - a number that's expected to increase to 246 billion by the end of 2019. Most of the increase is down to emails use for notifications (offers, promotions, etc.) rather than for interpersonal communications. The average number of emails received per user per day is estimated at 92 with the number sent significantly lower at 32. According to Campaign Monitor, for every dollar spent on email marketing campaigns, the average return is $38. If we assume for a moment that 50% of the 200 billion emails sent per day are promotional, then 100 billion emails per day at (for example) an average cost of $0.10 per email would be generating $142 trillion of returns per year - or nearly two times the size of the 2014 global economy! This example should make it clear - not every email marketer is generating $38 of returns for every dollar spent! Not every email is equal so not every email will earn a return of 3,800%. To earn such a high return, you must be in the top tier of expertise for running email marketing campaigns. To illustrate this point, I have broken down global email marketing (in a very simplistic way) to assess its performance from four different tiers. I need to stress the data in this table is for illustrative purposes only and it's a simplification of reality. Its purpose, however, is legitimate. It demonstrates that only the cream of the crop of professional email marketers can possibly be earning $38 for every $1 spent. If $4 trillion of annual revenue is earned from around $300 billion of annual email marketing investment and thereby accounts for 5% of the global economy then, based on these numbers, it passes the sniff test, whereas the general statement that the average return for all email marketing is $38 for every $1 spent, does not! As can be seen in this example, only 2.5% of marketers achieve the 3,800% ROI gold standard. It's not to say that decent returns can't be earned lower down the scale - it's just that they're not going to be 3,800%! Think for a moment about independent office products and equipment resellers and think about typical marketing emails you may have seen from this channel. They're usually product offer oriented - i.e. 20% discount on a Brother TN450 cartridge. Well, how many of that marketer's contacts have a Brother machine that uses a TN450 cartridge and, worse still, how many of those that do, actually need a cartridge when the marketing email arrives? 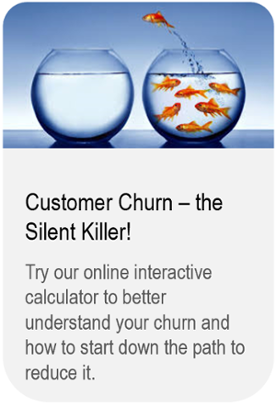 This is email marketing at its worst and its ROI is likely to be at the low end of the scale. Now think for a moment about combining business intelligence with email marketing. Imagine having your Data Collection Agent installed at a couple of hundred local businesses and gathering intelligence on 1,000 or more printers. Now you're going to know what cartridge is needed and when. Now you're empowered to perfect the timing of a relevant email marketing campaign. Imagine a series of educational emails during the period leading up to the point a cartridge needs to be purchased explaining the value proposition of aftermarket cartridges versus the OEM brand. During this window, the opportunity is taken to lay the foundation for a conversion from OEM to aftermarket that will increase the chances of a future, well-timed promotional email achieving its desired outcome of a sale. The prospect of generating $38 of revenue for every $1 spent clearly makes direct email marketing appealing. However, the point of this paper is to explain that only a small number of marketers achieve these kinds of results. Nevertheless, it's the potential for such attractive returns that should motivate resellers to learn how to conduct effective email marketing. Facebook and Twitter (for example) will not yield these kinds of returns and have their own challenges in terms of audience building and engagement before they can be developed to be worthwhile at all. Email marketing is important and is likely to remain so for years to come. Our objective in this paper is to help independent office products resellers understand how to approach email marketing and advance through the ROI tiers I've identified. By doing so, they too can start to improve returns on the relatively modest investments required for conducting effective email campaigns. The bottom line is that modern business is being digitized and email marketing is an important component of this process. Stick with traditional analog methods and continue to see your business erode as digital competitors' chip away at your existing customer base. Start to implement your digital business transformation strategy and start to win new customers and participate in improving the future for office supplies dealerships, not least that of your own! Obviously, you can't conduct email marketing campaigns without contacts but, once you have a list of contacts, what are some of the fundamental requirements to establish and maintain the foundation for effective email marketing? As explained in the opening section, it may be possible to earn an ROI of as much as 3,800% but, to do so, you must position yourself to perform among the top-tier of elite email marketers. This means each element necessary for an effective email strategy must be optimized. The first email element I'm focusing on is the contact list and how this must be organized and managed for inbound digital marketing campaigns to be optimized. Contact details - ensure they're accurate - first and last names must be spelled correctly and written in upper and lower case appropriately capitalized. Contact ownership - if you have multiple salespersons make sure your entire contact list is assigned an owner and, as the contact database is expanded, all new contacts continue to be assigned one. Contact qualification - site visitor conversions (email contact adds) must be qualified. New contacts captured through content offers should be contacted within an hour if at all possible. Once qualified, the lead can be handed over to sales for the next stage in the sales process. Email decay rates - contact databases typically decay by 20% or more annually. Email addresses change, get retired and subscribers opt-out. Job changes - your very best contacts may move from one company to another so, if you don't maintain your database, you could lose a powerful contact. New subscribers - must be constantly added to preserve value in your contact database. A database of 20,000 contacts will typically deteriorate to around 10,000 within four-years unless there's a strategy to obtain new contacts. Contact segmentation - roles and responsibilities for each contact must be identified. Is your contact a decision maker or an influencer? Is the contact so far down the totem pole he or she will have little to no value as an influencer? Define channel verticals - do you have your contacts clearly segmented by the different verticals you sell into? For example, if you're selling products and services to Accounting Firms and to Law Firms your contact database must be accurately segmented by these two verticals. Relevance & engagement - are your contacts relevant? Did you develop your contact database or was it obtained from a third-party? Are your contacts going to be surprised if they hear from you or have they opted-in to your email marketing program? Static Lists Versus Smart Lists - one thing is certain in that "everything changes all the time" so, it's important to have automation tools to segment lists based on what contacts do. Someone downloading content from your website is telling you they have an interest in the topic that material contains. That should mean the contact is added to a list from where you can focus your future marketing collateral on that interest, sending relevant, interesting material, minimizing opt-out's, and maximizing engagement! Email marketing has the potential to be a significant component of a digital strategy to help improve the future for office supplies dealerships and to exploit an office products growth opportunity. But, to do so, it must be done right! A 20,000 contact list will most likely lose 20% of its volume each year through decay. That's 4,000 contacts lost in 12 months or 80 per week. To maintain a volume of 20,000 contacts means you must add 80 new ones every week. Simultaneously managing the 10 requirements identified above without the use of automation tools will take up a lot of time, time that, ultimately, will most likely not be allocated, resulting in a poorly maintained list ineffective for world-class email marketing efforts. The building, expanding and maintaining a list of relevant, engaged email contacts must be a high priority for businesses in the modern digital world. However, the only way businesses will stay motivated to make this a priority is if they see positive results from the efforts. Implementing strategies for obtaining new contacts through inbound web traffic and deploying automation tools for segmenting contacts to allow effective targeted marketing are vital elements for world-class email marketing results to be obtained. Bottom line - you must earn your email contacts and you have to maintain them. 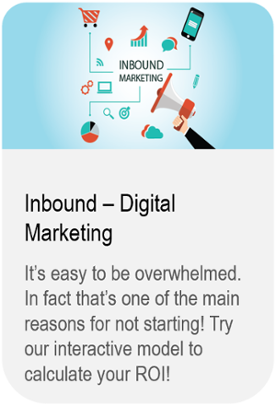 Inbound marketing can be an effective way to build a contact database but, it's not likely to be worth the effort without software automation tools for maintenance and segmentation purposes. So now you know it could be possible to earn up to a 3800% return on funds invested when operating amongst the elite of email marketers. However, to get up among the elite requires a whole bunch of email marketing parameters to be optimized. We've previously published content about the first of those - a clean, accurate, opted-in email contact list that utilizes levels of automation to enable accurate segmentation and progression of leads through the sales funnel. Now, in this section of our paper, I'm going to explain the concept of, and the need for, developing Buyer Personas and mapping contacts to the different stages of the Buyer's Journey. Marketers not actively involved in digital marketing have most probably not carefully considered the personas of their typical buyer's. Briefly stated, and according to Inbound Digital Marketing pioneers, HubSpot, "a buyer persona is a semi-fictional representation of your ideal customer based on market research and real data about existing customers." At their most basic level, personas allow marketers to personalize and target marketing efforts to different segments of their audience. This means, instead of sending the same email content to each member of a contact database, they can be customized according to the buyer persona with the message tailored specifically to what is known about each different persona. May have a future need but is not at the decision-making stage for purchasing the product or service. Marketing emails that fail to incorporate these elements of sophistication will perform poorly in terms of open and click rates as well as lead to higher contact degradation rates through opt-outs. Furthermore, in performing poorly, the marketer will fail to establish him or herself amongst the elite and will fail to earn the highest levels of return on their marketing investment. If you're one of many office products resellers new to inbound marketing and the concept of Buyer Personas, then you may not know where to start to develop yours. Download our proven Buyer Persona Development template and get yours underway! Having explained the breakdown of the process you should start to see it has the potential to be taken advantage of with content crafted to be relevant to each of the different stages. Of course, to do so, you must know how to determine where a buyer is in the purchasing cycle and how different search queries can be used to help uncover this information. 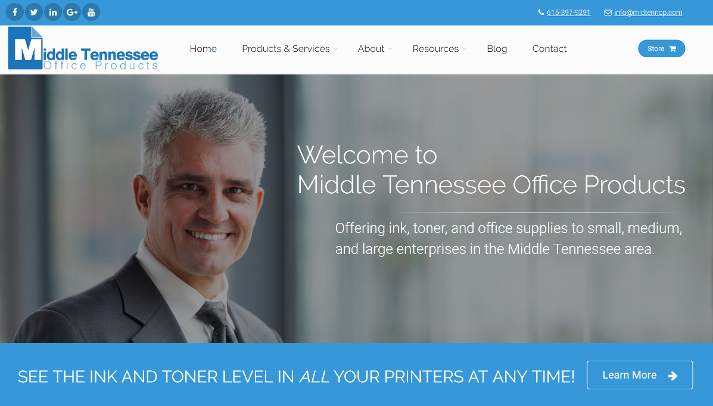 "Office printer" - this is a generic term most likely used by customers in the awareness or consideration stage. "Compare laser printers" - the intent to compare indicates the customer is further along in the buying cycle, such as the consideration stage. "Hewlett Packard LaserJet Pro M426FDW" - a very specific product search indicating the buyer is much further into the buying cycle and is evaluating prices right before a purchase decision. Your brand story, expertise, etc. It should be clear, the action to send a company newsletter or special offer to a buyer in the awareness stage, or sending a white paper explaining the total cost of ownership for a printing device to a buyer that has no need for a new printer and may already be purchasing from you, are not intelligent email marketing tactics. Failures of this nature will ensure that, not only will you fail to earn a spot among the elite group of marketers, but you will also fail to earn the highest returns on your digital marketing efforts. Furthermore, because your performance will be sub-par, you will not be motivated to invest your time and resources into developing one of the most valuable assets you can build in the modern digital age - your email contact database! This paper started with an introductory section on the returns on investment from email marketing, widely reported to have the potential to be as much as 3800%. However, I stressed these kinds of returns would remain out of reach for all except an elite of digital marketers and, in order to join the elite, the best practices for all elements of email marketing must be achieved. In this section, I'm going to focus on the planning and strategy components for successful email marketing. First, remember, one size does not fit all. Email campaigns must be tailored to fit the audience so (once the contact list is intelligently segmented) it becomes possible to target each segment with the right content, in the right place, at the right time. The marketing efforts will then be more likely to enjoy higher levels of engagement. 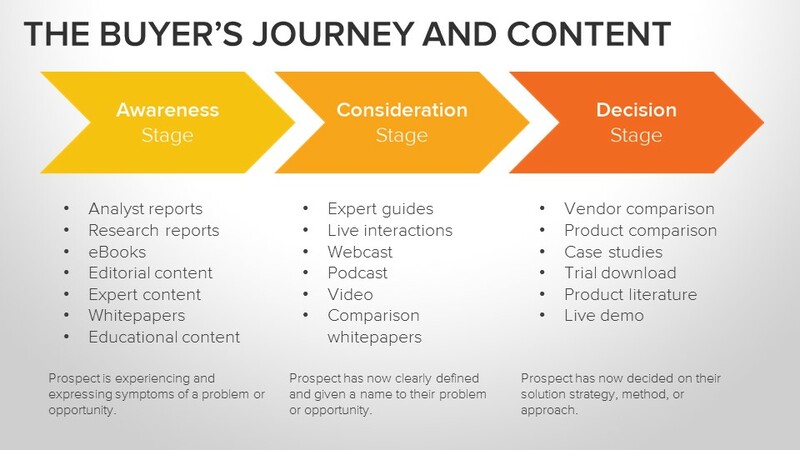 Organizing the "content" library according to the persona and the buyer's journey (or lifecycle stage) is a fundamental component of the email marketing planning stage. Remember, the objective is to engage with the audience. Engagement means "opens", "clicks", and "conversions" with, ultimately, it all being about the last on the list - conversions! There's no point bragging about 40% open rates if you have 0% conversions. A conversion occurs after a member of the audience opens an email, clicks on a call-to-action, and then fills in a form providing the information you want in exchange for the content you're providing. This will only occur if the content is relevant and deemed to have value by individual members of the contact list. Furthermore, the conversion step (the desired outcome) can only occur if the first two steps (open and click) have been successfully accomplished. Because the members of the contact list have different interests and requirements, poor segmentation and poor content mapping will unavoidably lead to poor engagement and poor conversion rates. The Case A marketer may send out two emails a week and never achieve any events toward the desired outcome. The Case B marketer may send out two emails every week, achieving 624 conversions (6 [conversions] x 2 [per week] x 52 [weeks per year] = 624) through the 12-month period. If 5% of these conversions can be turned into new customers that's 31 new customers or 6% of the leads. Case C tells a story at a different level altogether - using the same number of contacts and the same email frequency, there will be 2,496 conversion events (24 x 2 x 52 = 2,496) and, if the same percentage as Case B (5%) are converted to customers, that's 125 new customers or 25% of the leads the campaign strategy was targeted at. In Case C example there have been nearly 2,500 conversion events on 52,000 individual email "sends" over a 12-month period resulting in a final conversion rate of 4.8%. To accomplish this, it required a 100% delivery rate, 45% open rate, 30% click rate and a 35% conversion rate. Conversion rates of these levels can only be achieved by elite email marketers, not only requiring great tactics, planning, and strategy but also, great content timed to match each of the individual contacts current position in the journey through the buyer's lifecycle stages. Once a marketer has built a high-quality library of content offers and deployed technology for contact management [including the use of automated list segmentation updates as dictated by opens, clicks and conversions] a well-considered email marketing strategy is the next step necessary for extracting the most value from the content and the highest returns from the effort. It takes time and effort to prepare different email content targeted at different personas in different stages of the buying cycle. However, as the example above should have demonstrated, it will result in better outcomes than mass launches of generic emails. Depending on where the target audience is located this capability becomes an important factor. Sending an email at 8.00AM on the East Coast to a recipient on the West Coast with a 3 hour time difference may not be the optimum time for the West Coast contact. This poor delivery timing will be reflected in reduced open, click and conversion rates. I don't think much more should need to be said on this! But ... to reinforce the point, sending special offers, discount coupons, etc. on random products to contacts that are still in the awareness stage of the buying cycle, is a misplaced, counter-productive strategy. We all already receive far more email than we can handle and there's nothing worse than getting bombarded with too many marketing emails from a source you've signed up with, with high hopes for informative, relevant, and timely content. For the sender to accomplish the optimum balance between too much and too little, it will take constant monitoring and adjustments of schedules and frequency to best suit the preferences of the audience. Failure to do so will lead to spam reports and opt-outs. The best email marketing strategies must incorporate time for analysis and fine-tuning. Some contacts may complete multiple forms in exchange for various content offers through the nurturing process and the shorter the form the more likely it will be submitted. The use of technology, to enable "smart" and "progressive profiling" fields, allows a more complete profile of the lead to be built over time. This can be accomplished without showing a lengthy form that's more likely to deter and lead to a lost conversion opportunity. Have additional offers in the lead nurturing pipeline to facilitate moving a lead from one stage in the buyer's journey to the next. If a contact in the awareness stage shows interest by downloading a piece of educational content, then the "thank-you" page should contain a related offer that's targeted more at the consideration stage. If your educational content does its job then the consideration content is more likely to become relevant to the lead. Content is King! Again, no more should need to be said! To capture a lead through a conversion the visitor is giving up personal information. He or she knows this means they will be the target of additional marketing materials and, if the content isn't judged to be worth the exchange, then the conversion will either not occur in the first place or it will be the subject of a rapid "opt-out" later. We already talked about the importance of a clean contact database, no misspelling, correct capitalization, etc. Once this is accomplished, leveraging first names to personalize email can become an important factor for optimizing open rates. If This, Then That (ITTT). So, you've sent an email, it was opened, it was clicked and your form was completed and submitted. Congratulations - a major goal was achieved. But ... what next? If you don't have a plan, and you don't have a workflow, then your nurturing process stalls and the lead you worked so hard for flounders in your sales funnel. In Case C example used in this paper nearly 95% of the contacts were moved out of the awareness stage and deeper into the buyer's journey. Unless there's a strategy to replenish leads using blogging and social media tactics, then the sales funnel will empty over time. Anybody can randomly blast an email contact list with poorly conceived content but it's unlikely to provide much of a return. 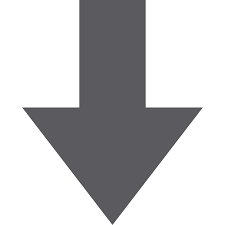 The average email list decays at 20%+ per year. A contact list targeted with no thought to strategy or content quality will decay much faster. There are rarely any silver-bullet solutions. Doing something well means working hard and thinking carefully about what's being done. Effective email marketing requires intelligent effort and it requires a library of content - both mean time and effort have to be invested. The common perception may be that email is old school and social media is the way to go. However, for marketers prepared to invest the necessary effort, there's the potential to join the elite and earn significant returns. Getting a well-targeted email directly into an inbox still beats social media engagement rates hands down thereby ensuring there remains an important place for email in modern-day digital marketing. There's an email strategy for resellers that can make a difference over time, but it requires hard work, the use of technology, and an ongoing, consistent effort. In this section, I'm going to focus on the use of automation and workflows as well as the execution component of email marketing. Building a foundation with the required scope for successful email marketing is not easy. Only the elite email marketers have accomplished it and, chances are, as an independent office products reseller, you probably haven't! However, let's hope you're starting to put the foundation in place because, you're probably not a social media expert, you have a limited social audience, and no current activity to build or engage with what social audience you do have. In these circumstances, email marketing will be your best shot. It has the potential to provide the biggest, short-term "bang-for-your-buck", helping you catch-up with the big-box competition who are already actively marketing to your customers and prospects. Social media audience development and engagement cannot be ignored forever but it's probably your best bet to get email marketing up and running first. 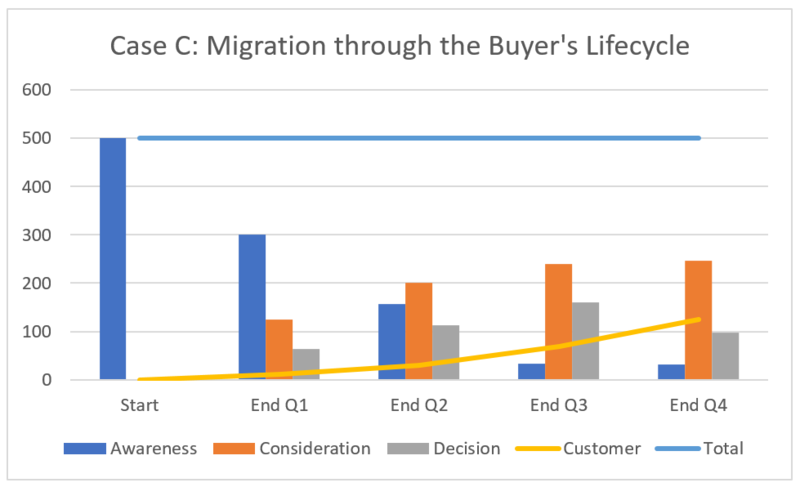 In the example shown in the table below, there are around 2,000 contacts divided evenly between five buyer personas and the three lifecycle stages. Effective segmentation of the contacts creates 15 different lists. Think about what your ideal outcome is after you press the launch button - of course, you want 100% open rates, 100% click rates, and 100% conversion rates. But you know that's not going to happen, so you must be prepared for the "If This, Then That" (ITTT) scenarios that are inevitable with email marketing. In the above example, list segmentation according to the persona and lifecycle stage means the same email is only sent to 130 contacts. Let's focus on a blast to Persona # 1 in the "awareness" stage. You achieve a 30% open and 20% click rate meaning 70% of the recipients did nothing. What do you plan to do next with those that did nothing? Of course, you need a follow-up email waiting in the wings, to prod those that didn't engage, to do so with a second email. What about the 30% who opened the email and the 20% who clicked? Again, you need a follow-up email (perhaps promoting a demo) to those that clicked. Finally, what about those that opened but didn't click? Of course, you need a follow-up email for this group as well. So, as you can see, on just one of our 15 lists we had three different actions waiting on the sidelines, depending on the different contact engagements. For all 15 lists having a minimum of three different emails waiting on the sidelines, the strategy requires preparation of 45 different emails, just for the first cycle of the campaign. That's 45 different emails before even we start thinking about A/B testing but more on that another time! An example of a simple "If This Then That" workflow. Finally, think about the movement that's going to take place between the lists. Someone in the "awareness" stage who converts, and downloads content must be moved to the second (consideration) stage. Likewise, someone who books a demo must be moved from the "awareness" to the "decision" stage. It should be clear, there are a lot of moving parts and, the ability to manage such a level of complexity without automation is next to impossible. Setup correctly your email launches will cease to be a once or twice a week event. Instead, they'll be triggered through automation based on recipient actions. Emails will be leaving your system 24/7 in dynamic responses to all types of actions taken by visitors. Whether it be the result of conversions through calls-to-action and form submissions, (designed to gather relevant information and building progressive profiles matched to your various buyer personas), or whether it be the result of inaction by the contact. Every action or inaction must have a consequence that triggers the next event in the process. This is the science of email marketing and this is what must be accomplished if you want to join the elite and start to earn the $40 returns on every dollar spent. Once you've set the rules for list segmentation, prepared the content offers, mapped them according to personas and lifecycle stages, created the email templates, and set your launch timetables and triggers, not only will you have invested a significant amount of time, you will also have learned getting everything in place wasn't a simple process! However, these steps were all key requirements before successful email marketing can commence and, as you may expect, if you want to perform among the elites, there is no alternative to investing the time to accomplish this. In preparing to conduct email marketing from this foundation with the level of sophistication that becomes possible, an asset has been created that's of significant value for generating leads and future new business. In fact, it's an asset that establishes a competitive advantage for developing a significant growth opportunity. Let's go back to our example with 2,000 contacts segmented into five buyer personas, three buyer lifecycle stages, and an equal distribution of contacts between them. Remember, to successfully place yourself among the elites, you must ensure you're sending the right content, to the right place, at the right time. To accomplish this you will need to send different emails, with different calls-to-action, and with different content offers to each of the personas and lifecycle stages. In this example, our reseller has developed five different personas according to the buyer preferences. The resellers objective is to migrate all his contacts toward Persona # 1 because he knows the most profit can be made on aftermarket office supplies and he knows that's where the consumer can save the most money. Different types of content will be necessary to achieve migration from Persona # 5 toward Persona # 1 that will be required to migrate a Persona from # 3 to # 1. In addition to the objective to migrate the contacts to the optimal persona via the education process, the resellers objective is also to migrate the contacts through the lifecycle stages toward the decision stage and, of course, to eventually become customers. Again, different types of content, according to where the individual buyers are in the lifecycle, are required to achieve this goal. The results shown at Stage 2 of the reseller campaign demonstrate some success in achieving the goals with 42% moved to the decision stage and a total of 51% into the Persona # 1 or # 2 categories. The high standard of preparation and execution required to achieve these results has the potential to contribute significantly toward improving the future for office supplies dealerships deploying advanced email marketing strategies. There's one more significant element underlying the strategy to achieve world-class results with email marketing. You may be wondering how automation can be utilized to determine the transitions from one persona to another and from one lifecycle stage to another. For sure this cannot be done effectively without strategy, preparation, and technology. Emails must include calls-to-action (CTA) that contain links to landing pages. Contacts click on the CTA because they're interested in the content being offered. The landing page they lead to must contain a form that has to be completed before the content is accessible. The conversion process (form completion and submission) is a transaction - in exchange for the personal information you've requested from the contact, you provide content they've decided it's worth providing the information for. One of the key objectives of the form is to discover as much about the contact as possible. However, the problem is, the longer the form, the less likely it's going to be completed so, you have to be patient and work to accomplish the goal over a period of time. This is where "smart" fields and "progressive" profiling comes into play. Your most engaged contacts will engage multiple times so, the idea is, that each time they come back for more content, your form is structured to gather a little more information. You don't need the information collected on previous visits so, your "smart" form doesn't even show those fields, instead, it slides in two or three new fields with requests for new information. Each form that's completed then permits you to build a more complete profile of the contact. Intelligent questions, intelligently sequenced, allow a more accurate persona to be developed. It also permits actions to be set that automatically move the contact from one persona to another as well as from one lifecycle to another. Your form may have 40 or more fields but never will more than 3 or 4 be shown at one time. Not only is this information gathering process unobtrusive, but it's also of indispensable value in terms of accurate persona development and lifecycle stage determination, thereby ensuring the right content can be delivered in the right place, at the right time, in a workflow that's scalable, efficient, and effective. Well, any remaining myth that an effective email strategy for office products resellers may be carried out with routine email blasts, randomly firing off special offers, should surely have been dispelled. Any desire to join the elite and earn high returns clearly have to be worked hard for. Technology must be utilized. It should be clear, the strategies and tactics outlined in this article, cannot possibly be deployed without the use of technology. Finally, understanding your buyer personas and creating content carefully targeted to the persona and the three lifecycle stages, is a fundamental requirement. In fact, spending time and resources evaluating technology systems and cleaning up an email contact database is a waste, unless serious thought has been dedicated to the content creation strategy. You can have the best technology systems money can buy and you can have the cleanest email database possible but, without content, it won't be worth a dime. If you're going to do email marketing then, to achieve satisfactory results, you must do it properly. This paper should have made it clear that high-quality email marketing is not easy. It takes time and effort to get your contact database organized, it takes technology and the ability to use it, it takes creative talent for preparing content and, it requires the ability to set campaign goals, measure performance against those goals, and to calculate the return on investment. Measure performance against those goals. Calculating and measuring the ROI (return on investment). Let's not forget the headline that email marketing is one of the most cost-effective forms of marketing, capable of generating 4000% returns (or $40 for every $1 spent) if you're operating at the elite level of email marketing. 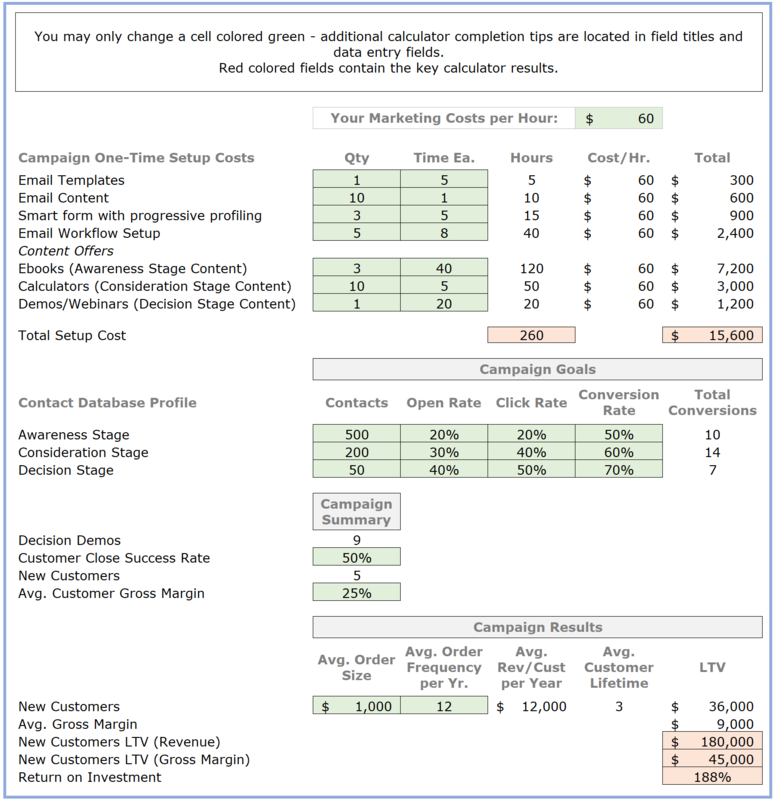 I've evaluated numerous online calculators and, while they may display compelling ROI's of up to 4000%, most don't take into account that the ROI should be calculated off margin (or better still profit) dollars rather than revenue dollars (which most do) and, nor do they really help a marketer understand all the steps required to achieve the ROI results they indicate. Never forget the old saying "you get what you pay for" - for sure it applies to potential returns on email marketing investments. If you fail to invest sufficiently in your campaign, you will waste what you do spend and fail to get the results you hoped for. The example I've included below details over $15,000 of one-time setup costs. These costs consist of time, in fact, 260 hours, with each hour invested valued at $60. Nearly 80% of this time resource investment is required to prepare content offers. This allocation should make intuitive sense as it's associated with time spent preparing content to be offered in exchange for completing a form. If the content (the campaign foundation) is not high enough quality or deemed relevant by the target audience, it will not be opened, clicked, or converted. Remember, your contact database contains leads that are at different places in the three buyer lifecycle stages of awareness, consideration, and decision. It should be logical for you to expect you'll get different levels of engagement from the contacts who are at different stages in the lifecycle, with higher engagement rates at the consideration and decision stages, than at the awareness stage. Also, as explained in Part 3 of this series, Planning Email Campaigns & Strategy, the most important metric to measure is conversions. A conversion takes place when a reader fills in a form in exchange for free content you're providing. It should be clear, a conversion cannot occur until an open, and a click, have already taken place. If 500 emails are sent to contacts in the awareness stage and you achieve 20% open, 20% click and a 50% conversion, then the result is 10 conversions. (500 x 20% x 20% = 10). A contact in the awareness stage doesn't know you well, if at all, so it's logical to expect lower engagement rates than in the consideration and decision stages where a contact will have engaged previously with your content. In the example below, you can see engagement rates (opens, clicks, and conversions) at the consideration and decision stages are higher than those at the awareness stage. Assuming you've already segmented your database according to the lifecycle stages, and you're sending relevant content purposed for these different stages then, 500 contacts at the awareness stage results in 10 conversions, 200 at the consideration stage results in 14 conversions, and 50 at the decision stage results in 7 conversions. The 10 conversions at the awareness stage will move those contacts into the consideration stage where they will go through the 30/40/60 conversion rates, (10 x 30% x 40% x 60% = 1), resulting in one addition to the decision stage, where a new total of 65 (50 + 1 + 14) x 40% x 50% x 70% will result in a total of nine (9) conversions. Based on this example and the assumptions I've used; the goal of this campaign would be to achieve nine (9) demos to prospective customers. Click button above for the interactive version of the calculator! Now we have established clearly defined goals for conversion rates at the three different lifecycle stages and have calculated the goal for nine (9) product demos, we can finally calculate the projected return on investment. Using these assumptions, we know the lifetime (revenue) value of a new customer is $36,000 and the lifetime (margin) value is $9,000. With five (5) new customers projected, the return on investment (using gross margin, not revenue, as the determinant) is calculated at 188% - not too shabby, but still a long way from 4,000%! There are numerous variables affecting the ROI. Obviously, the gross margin percent, the average order size, and frequency, along with the lifetime value of the customer are key but, so also are the number of contacts and where they are placed in terms of the lifecycle stages. Experienced marketers, with an engaged contact database, will most likely have higher proportions of the contacts in the consideration and decision stages which, in turn, will be likely to lead to higher ROI outcomes. However, even experienced marketers launching new products must take their contacts through the beginning (awareness) stage before they can expect to achieve the higher conversion rates associated with the consideration and awareness stages. So, whether you are an email marketer starting out, or a veteran of numerous campaigns, it will always be necessary to be moving contacts through each of these three stages. There are many variables affecting the goals and potential returns on investment from email marketing. 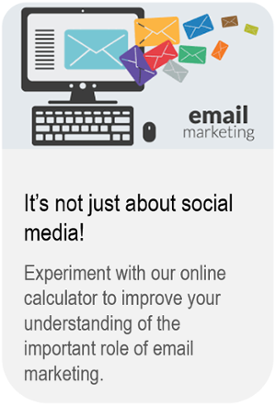 To develop an even better understanding of how all these variables interact, and to learn how you may fine-tune your email strategies and focus your efforts to achieve the highest returns, please access our interactive email ROI calculator and experiment with your own numbers. To do so, just click the access button below. At this point it should come as no surprise that the foundation for a digital transformation is a rule-conforming, content-rich, and mobile-responsive website - a website you can rely on to promote your brand 24/7, that's fully integrated with social media and email marketing tools, and incorporates technology for visit-to-lead conversion strategies. Click the website image below to learn more! *You can edit before tweeting.